If you're in Wellington and have a bike you can bring it over on the train or if you're from further afield/don't have a bike on you, one (or twenty-one or more) can be hired. The Remutaka (Rimutaka) Cycle Trail is a ‘Great Ride’ on Nga Haerenga, the NZ Cycle Trail. 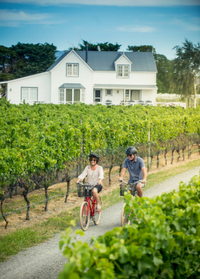 Extending from Wellington to the Wairarapa, this ride takes in urban and rural landscapes with exceptional experiences on the historic Rimutaka Rail Trail and the Wairarapa south coast. The Wairarapa section of the Remutaka (Rimutaka) Cycle Trail can be experienced with 1-3 days of riding depending on ability and easily tied in with other Wairarapa activities you might choose to experience. Because this ride is best done over a period of days it is suggested you stop for the night at some of the fantastic accommodation along the way; heading south from Featherston & Cross Creek, take a look at Prairie Holm, Waiorongomai Station, Western Lake Woolshed and Te Rakau or if you want something a bit special then Wharekauhau Country Estate is the place. Heading into Featherston check out some Featherston accommodation options. In Martinborough wine village there is the Martinborough Hotel. From Waipukurau to Masterton this 202km touring route generally takes about two days and feeds nicely into the Remutaka (Rimutaka) Cycle Trail. From Waipukurau to Masterton this 202km ride generally takes about two days and feeds nicely into another Nga Haerenga 'Great Ride', the Remutaka (Rimutaka) Cycle Trail. Route 52 touring route takes you through some pretty amazing country towns and farmland and offers some fine country hospitality options for any overnighters. You'll be biking in some pretty remote places so do take with you plenty of food, water, tools and spare clothes. On the edge of Masterton, is the Pointon Heritage Car Collection. All the vehicles have a relationship to the Wairarapa. The owners will take you through on a guided tour of the vehicles which in turn tell the stories of the region. River Grove Olives, Gordon Street (opposite Henley Lake) has modern olive grove accommodation and make sure you have an oil tasting and maybe pick up a bottle or two as gifts. On the hill in front of River Grove is Masterton Golf Club, the towns premier course, home to Sir Bob Charles and is open to casual players. Lansdowne House is an historic property with accommodation and site of the original vineyard in the Wairarapa. At the intersection of Te Ore Ore Road and State Highway 2 is Mawley Holiday Park which is bordered by the Waipoua River. The main entrance is off Oxford Street just to the right. There is an enormous range of places to stay in Masterton. 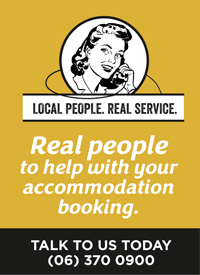 It's easy to book Masterton accommodation online. For more information on all the things to do in and around Masterton and the Wairarapa, drop in to the Masterton i-SITE Visitor Centre on the corner of Dixon and Bruce Street, Masterton. From Masterton through Gladstone and out to Martinborough before heading to Featherston via East/West Access Road and Western Lake Road this 67km touring route generally takes around 6-8 hours. From Masterton through Gladstone and out to Martinborough before heading to Featherston via East/West Access Road and Western Lake Road this 67km ride generally takes around 6-8 hours. This touring route links up perfectly with the Wairarapa section of the Remutaka (Rimutaka) Cycle Trail beginning at Cross Creek along Western Lake Road. There is a selection on route to Martinborough just out of Masterton. A diversion from the route at Gladstone will take you to the locally famous Gladstone Inn (The Gladdy) where excellent pub lunches can be had. Take a look at some fantastic options here. A diversion to Lake Ferry on the coast is a must and will probably mean you stay the night. Heading back up to Featherston on Western Lake Road, historic Waiorongomai has redecorated old cottages and the beautiful 90 year old homestead available. Western Lake Bach is a bit further along sitting as a whole of house option. Then Prairie Holm has cottage options on a dairy farm in a lovely 5 acre garden environment. There is a range of accommodation available in Featherston and can be easily searched here. The Fell Locomotive Museum – tells the stories of the engineering marvel of the Wellington Wairarapa train which crossed the Rimutaka Ranges. C'est Cheese - probably the best little cheese shop around. For more information on all the things to do in and around the Wairarapa talk to the staff at an i-SITE Visitor Centre. The Woodside Trail is a 5km route for walkers and cyclists extending from South Greytown to Woodside Station. The fully fenced trail has a slight incline to the train station, with views of paddocks, Tararua mountains and stands of oak trees. Join the trail from Cotter Street, Greytown, off Humphries Road. The Trail is suitable for walking, prams, and road and mountain bikes. It is not suitable for racing bikes, horses or motorbikes, and dogs must be on a leash at all times.